SynthMaster is an 'all-around' semi-modular software synthesizer and effect plug-in that features many different synthesis methods including VA, Additive, Wavetable, Wavescanning, Phase Modulation, Frequency Modulation, Pulse Width Modulation, Ring Modulation, Amplitude Modulation, Physical Modeling and SFZ Sample Playback synthesis. With its multi-algorithm oscillators, analog modelled/digital filters, flexible effects routing with 11 types of high quality effects and a massive modulation architecture with 95 separate modulation sources and 650+ modulation targets; SynthMaster is a 'must-have' for all synthesizer enthusiasts! 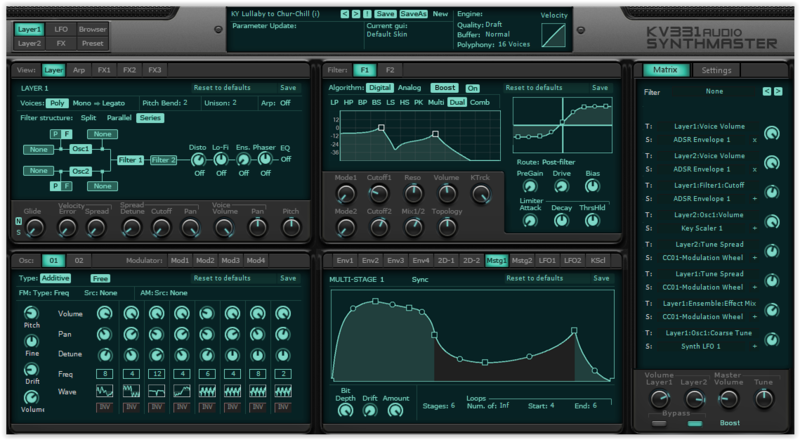 Cross-platform VST, AU and AAX: SynthMaster runs as a VST, AAX instrument on both Windows and Mac OSX, and also as an Audio Unit instrument on Mac OSX.